I like the idea of the homeless app described in a recent reblogged post. I think it would be great if these apps were connected to some kind of homeless social network where agencies could all be connected. When a passer by sees a homeless person on the street, he/she can use this app to take a photo of the person. This photo would be sent to the agencies connected to the social network AND when one of the agencies actually sends a case worker down to touch base with the person and ask them if they need assistance…. the agency or organization gets bonus points for getting grants. If the actually assist someone into a sheltered situation THEY GET MEGA BONUS POINTS. How’s that for using technology for mans benefit? Our era wears a unique shame: Great Depression levels of poverty surrounded by Gilded Age wealth. In 2015, the number of people who slept in New York City shelters broke the 60,000 mark, which includes 25,000 children – and it remains there in 2015, a new record. And that doesn’t count the mass of people who sleep on the street, or in the subway system. I love apps where I feel I am giving something back. I also like walking approximately 3-5 miles every day with my dogs. There are two apps that combine my love for walking my dogs with being able to give something back. The first app is Charity Miles where you are a corporate sponsored athlete. The app is easy to use. You simply choose a charity from among a long list of charities such as the The Michael J. Fox Foundation, Habitat for Humanity, St. Jude’s Children Hospital, The Leukemia and Lymphoma Society, The Wounded Warrior Project, etc. Then choose between one of the activities which are walking, running, and biking. The app keeps track of the distance and the amount earned per mile for that charity. Some of the corporate sponsors include Humama, Timex, Kenneth Cole, and Johnson & Johnson. Maybe those getting this help can open up their houses to homeless people who are screened and under case management as a way to get more people off the streets. They tried to do that in other places. Most of those units will turn into vacation rentals that benefit only the people that already own property. Pathetic. If policy makers would only be realistic. Do house owners want homeless people sharing bathroom and kitchen space? These small units do not have room for these facilities. Micro housing for the homeless only make sense if units are placed on a campground like setting with shared cooking and restroom facilities. That’s my opinion. T.J.
A national initiative to tackle homelessness by selling cabins that fit in backyards is being launched in Perth. An architecture firm in Aloha State has come up with an innovative solution to alleviate the problem of homelessness in their locality. It is giving some retired city buses a second life by transforming them into homeless shelters. “The idea is to convert [the buses] into living, sleeping, showering, recreational facilities,” Ma Ry Kim of Group 70 International architecture firm told Hawaii News Now. Such shelters will differ from recreational vehicles (RV), trailers or cars which are equipped with living space and amenities found in a home. Lots of good ideas every where, if people are willing to look for them and take a risk. 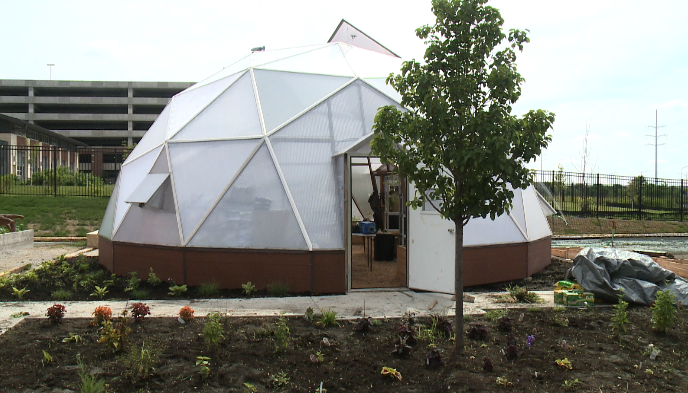 DES MOINES, Iowa – Central Iowa Shelter and Services, located at 1420 Mulberry St., debuts its growing dome Thursday after months of testing its gardening potential and a lot of help from the Greater Des Moines Leadership Institute. With labor and material donations from DuPont Pioneer, CISS constructed a 30-foot diameter growing dome, equipped with newly-installed microgreen beds, to grow fresh produce year-round, as well as host nutrition education and basic greenhouse management training for its clients. The fresh produce is used in the CISS kitchen, giving its clients fresher, healthier food. In the future, CISS says its hope is to sell excess produce to high-end restaurants in Des Moines, using the profits to benefit the sustainability of the greenhouse program. Sounds like Octavia Hill should be made a saint. God bless her efforts. 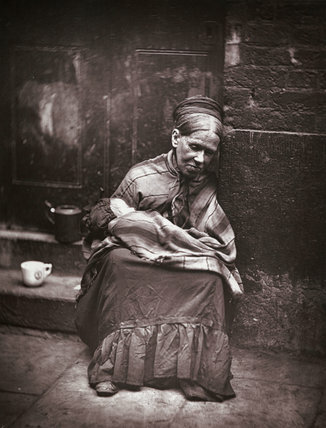 I recently went on a London walking tour which was entitled “Darkest Victorian London.” In addition to referencing the horrible industrial pollution that blanketed London during that time, the title primarily referred to the lives of poor people during the 19th century. Since this was also the time of the emergence of many social safety net programs, I found this historical walk completely fascinating, and did some further reading afterward. “The Crawlers” by John Thomson, circa 1877. Destitute mother and child.